The Geminid meteor shower peaks the week of Dec. 9, 2015. Astrophotographer Cody Limber took this composite image during the Geminid meteor shower on Dec. 14, 2013. This week marks the return of one of the best meteor showers in the year, the Geminids. They will occur with almost no moon in the sky, so they will be particularly easy to see. As the Earth moves around its orbit, it passes through various "debris fields" — collections of small particles shed by various comets of the past. In rare cases, asteroids rather than comets cause these fields, and the Geminid meteor shower is one of those exceptions. The Geminids, along with the August Perseids, are the two most active annual meteor showers. They can always be relied upon to put on a good show, and that is especially true this year, because the moon will be only a few days old, setting early in the evening. The nights of Sunday, Dec. 13, and Monday, Dec. 14, will be the best to view the Geminid meteor shower this year. People who are new to astronomy often aren't sure how to view meteor showers. While a few meteors are visible on any clear night, during a meteor shower they are more frequent, but it still requires some patience to spot more than one or two. The best view of most meteor showers is after midnight, when the Earth is heading directly into the meteor particles. The Geminids are unusual because the point in the sky from which they radiate is in the northern portion of the constellation Gemini, and so is above the horizon most of the night for observers in the northern hemisphere. Beginners often ask which direction they should look for the Geminids. It really doesn't matter much. Although the meteors appear to radiate from a point just above the bright stars Castor and Pollux in the constellation Gemini, they can appear anywhere in the sky. I generally prefer to look in the east for these meteors. This year, the Geminids peak around 1 p.m. EST on Dec. 14. This means that either the night before or the night of the 14th may be the best for observing the Geminids. Dress warmly, make yourself comfortable and prepare to be patient. Meteors are "naked eye" objects; telescopes and binoculars have too narrow a field of view to catch them. Sometimes you must wait half an hour or more before seeing a meteor; then you may get a whole bunch of them in a row. A dark sky is essential; the moon will not be a problem this year, but any light pollution will reduce your chances of seeing meteors. You can probably record some meteors with a digital camera using a time exposure of from 30 seconds to 2 minutes. In the old days of film, astrophotographers often wasted a lot of pictures before they got one or two good shots. With digital cameras, you can simply throw away the shots that don't show any meteors. 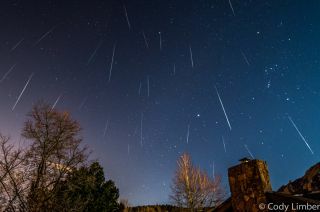 As always, we welcome your pictures of Geminid meteors. Editor's note: If you capture an amazing photo of a Geminid meteor in the night sky and would like to share it with Space.com and its news partners for a story or gallery, send images and comments in to managing editor Tariq Malik at: spacephotos@space.com.